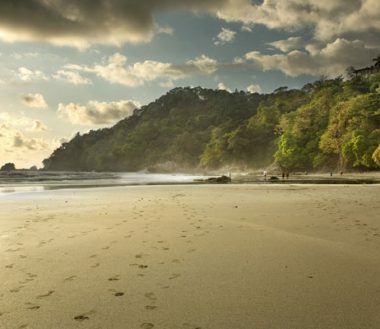 Mention the Osa Peninsula, Costa Rica and immediate thoughts turn to the Parque Nacional Corcovado (Corcovado National Park), which has been described as “the jewel in the crown” where Costa Rica’s numerous parks are concerned. This is the largest of Costa Rica’s national parks, covering approximately 165 square miles (425 square kilometers) and is home to over one-quarter of 2,000 species of trees found in the country. Flora and fauna abound, in the form of over 140 different species of mammals, 400 species of birds, 116 different species of reptiles and amphibians, and 40 species of fish, not to mention all the butterflies! Many of the beaches on the Osa Peninsula are also egg-laying sites of four species of turtle – the Olive Ridley turtle, the leatherback turtle, the hawksbill turtle, and the Pacific green turtle. The Osa Peninsula lies on the Pacific shoreline of Costa Rica, approximately 100 miles (160 kilometers) as the trogon flies from the country’s capital, San José. Lightly inhabited, ecotourism marries well with what is a nature-lover’s paradise made up of one of the most complex saltwater/freshwater ecosystems on the planet. 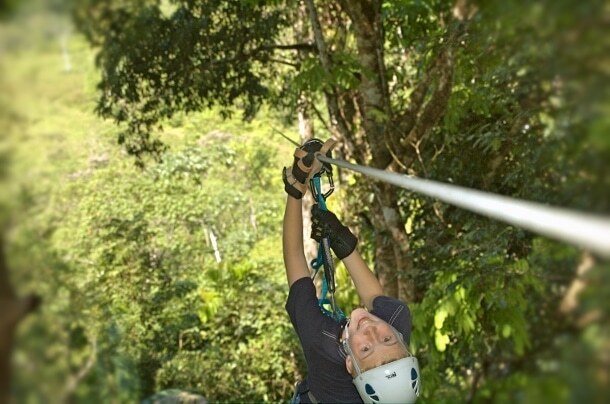 Intersected with trails, hiking tours of the rainforest can range in duration from half a day to three days. Puerto Jiménez is the only town of any significant size on the Osa Peninsula, Puntarenas Province, located on the south-eastern tip. Served by a domestic airport, Puerto Jiménez has a population of approximately 9,000 inhabitants and, in the 1960s, was a thriving gold mining community. To the north-west of the peninsula lies the small seaside village of Drake Bay, which is home to a number of the areas popular hotels. Aguila De Osa Inn – perched above Drake bay and enjoying stunning ocean views beyond the pristine sandy beaches. This is a lodge perfectly situated for marine and rainforest adventures, surrounded by nature at its best. The hotel has a charming, rustic feel to it, befitting of ecotourism, and you can enjoy superb food in its gourmet fine-dining restaurant. Copa De Arbol – accessible only by boat, this luxury beach and rainforest resort is set in 70 acres of untamed rainforest, offering you a fully immersive tropical jungle experience. Comprising ten beach-view cabinas constructed from recycled materials, the hotel lies less than 100 yards from the beach and sea, and offers an exceptional level of service, with a parity staff:guest ratio. Relax and lose yourself in the four-tier infinity pool or jacuzzi, while in the evening you can sample the freshest seafood and delicious local produce in the outstanding five-star restaurant. Pirate Cove Hotel – concentrates on simplicity, relaxation and the creation of a close-to-nature atmosphere. This beachfront hotel is nestled perfectly among the trees and provides the ideal setting for a memorable family vacation. Facilities include an outdoor pool, stunning gardens, restaurant and bar. Click here for further details of these and other hotels on the Osa Peninsula, Costa Rica. For such a sparsely populated location, the Osa Peninsula and Corcovado National Park has a surprising choice of bars and restaurants where predominantly Latin American and Costa Rican cuisine dominate. From sodas (small open-space restaurants which serve local Costa Rican food such as casado) to bars serving snacks, and larger restaurants which often include international dishes, with sea on three sides of the peninsula, it shouldn’t surprise you that seafood and fish are regularly on the menu, and wonderfully fresh too! Cafeteria Monka – Puerto Jimenez – breakfast will never seem the same back home! With its ‘tucked away’ location, the Osa Peninsula is not renowned as a beach lover’s paradise, but with coastline on both the Pacific Ocean and Golfo de Dulce, you don’t have to go far to find one. However, caution has to be taken and local advice heeded when it comes to choosing a safe spot for swimming. On the ocean side of the peninsula, powerful waves and strong riptide currents mean few beaches are suitable for swimming – a notable exception being Drake Bay Beach to the north. On the Golfo Dulce, waters are calmer and more suitable, but again listen to local advice, the gulf is frequented by bull and hammerhead sharks. Further details of these and numerous other great beaches on the Osa Peninsula can be found here. Trekking, hiking and camping are the three most popular activities on the Osa Peninsula. With the Corcovado National Park covering nearly one third of the peninsula, there can be few better places on the planet to discover wildlife in a totally unspoilt environment. The anticipation of seeing wild and endangered species of birds, amphibians and mammals precedes every adventure, while encounters with white face capuchins and mantle howler monkeys, two- and three-toed sloths, tapirs and silky anteaters are frequent. Corcovado is also one of the last refuges of wild jaguars and pumas. While it would be easy to focus your attention on the Osa Peninsula’s Corcovado rainforest, look to the sea for further memorable moments. Off the west coast of the Osa Peninsula lies Cano Island and the Cano Island Biological Reserve. Together with Drake Bay to the north west of the Peninsula, these are known wintering and breeding grounds for humpback whales, while you can also expect to see spinner dolphins, killer whales and false killer whales as they migrate through the area. For the very lucky, you might get to catch sight of a manatee, an almost mythical sea-creature that, until recently, had been heavily hunted and is now found only around Manzillo Beach. It is fair to say that the Osa Peninsula does not have a buzzing nightlife, but there is still a selection of places you can go at night if you want a change from relaxing in your hotel during your vacation. Aside from Bar La Jungla at Drake Bay, most other ‘nightspots’ will be found along the 245 road running down the eastern shoreline of the peninsula.